CMS users with Head Editor and Editor level just gained new, improved access. Now they can easily edit the second-level menu. Sign in to CMS Panel. Find and select menu edition icon. Select an element in the menu, which you want to move and drag and drop it underneath another element. This is how a second-level menu looks look like. Great news for all CMS users. Running an online store has never been so easy! Edit products in "Add to shop cart" in a simple and intuitive way. 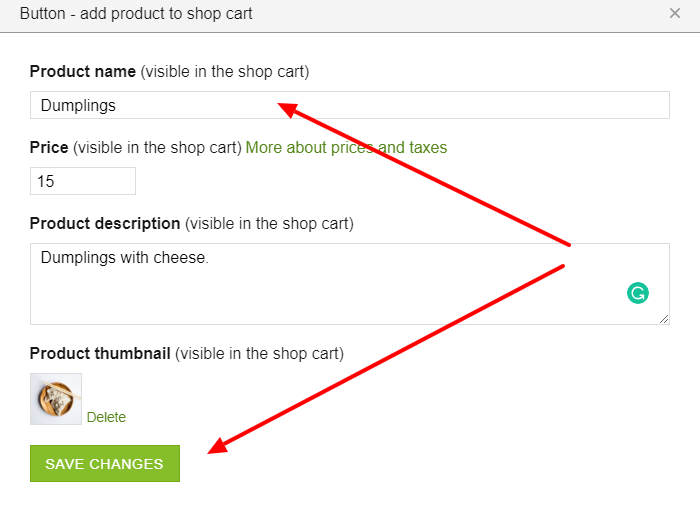 With this new functionality, you can quickly change texts, price, and images of every product. Sign in to CMS panel on your website. This is how our shop cart looks now. Find a shop icon next to "Add to shop cart" button. Change product name, price, and a thumbnail. Now in our shop cart, instead of pancakes, are dumplings. Well done!